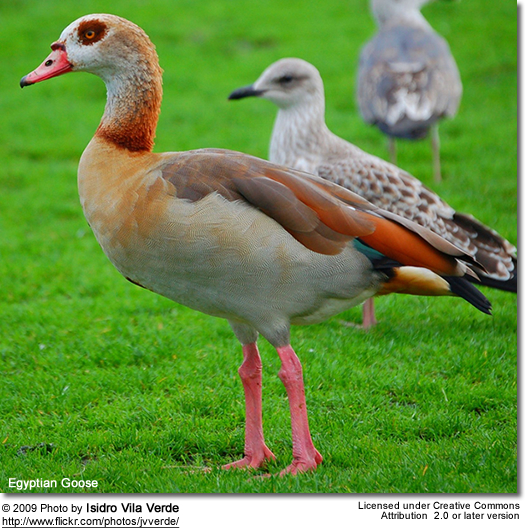 The Egyptian Geese (Alopochen aegyptiacus) - also known as Nil Geese named for their place of origin (the Nile Valley in Africa) - are large, very distinctive waterbirds with conspicuous dark chocolate-brown eye patches. These water birds are excellent swimmers, but are mostly terrestrial and can be seen perching on trees and buildings. Their maximum recorded lifespan in captivity is 25 years. 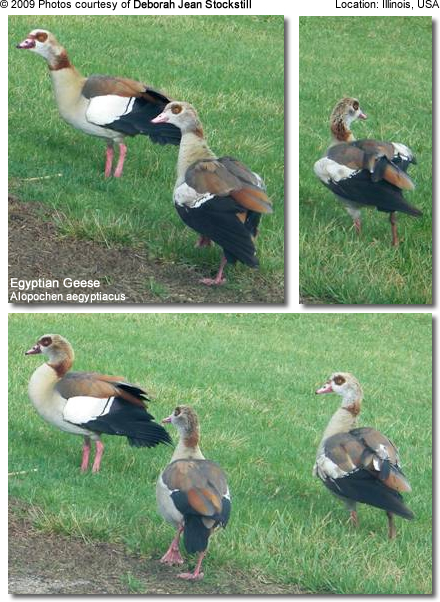 The ancient Egyptians considered the Egyptian Geese sacred and these geese appeared in much of their artwork. 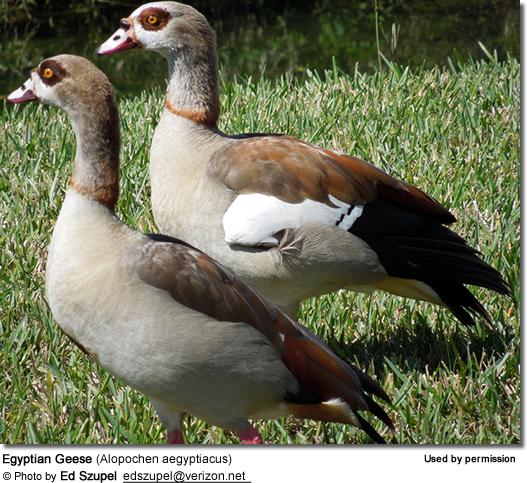 The Egyptian Goose is legally protected under the Agreement on the Conservation of African-Eurasian Migratory Waterbirds (AEWA). 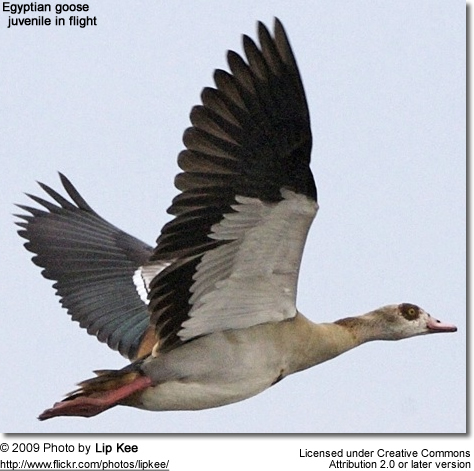 Egyptian Geese are most common in the Nile Valley in Northern Egypt and south of the Sahara desert. They are mostly resident (non-migratory), but undertake seasonal movements linked to the availability of water. They formerly occurred in Israel (until the 1930s) and southeastern Europe (until early 18th century). Europe: Great Britain and the Netherlands have self-sustaining feral populations, the former dating back to the 18th century, though only formally added to the British list in 1971. In Britain, it is found mainly in East Anglia, in parkland with lakes. In Germany, a pair was photographed in Oberaula, Hessen. Also: Austria, Belgium, Denmark, the Netherlands. USA: As the below photos seem to indicate, isolated populations of them can also be found in the United States. One settled in Pendleton, Indiana (Fall Park). The below photographs were taken at a pond in Illinois, USA by Deborah Jean Stockstill. Others were spotted in Florida (close to Fort Lauderdale) and Texas (north of Houston). They occur in various wetland habitats, grasslands or agricultural lands that are close to rivers, dams, lakes, reservoirs, marshes, estuaries, sewage works and, occasionally, offshore islands. 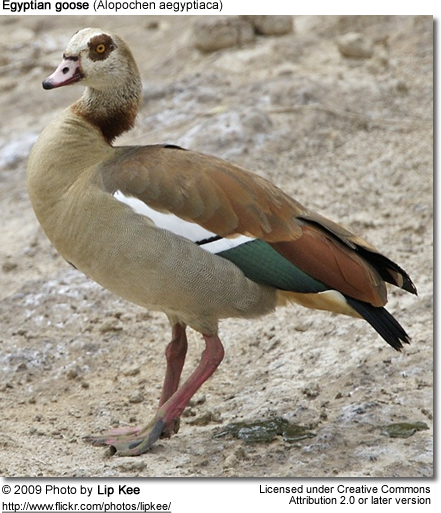 Egyptian Geese measure about 25 - 29 inches (~ 63 - 73 cm) in length - including the tail. 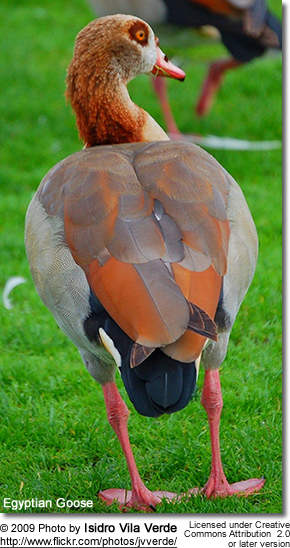 The upper plumage varies from reddish- to grey-brown, turning paler on the flanks and abdomen, with a distinctive chocolate-brown patch on the lower chest. The lower back, rump and tail are black. There is a narrow, dark reddish-brown collar around the base of the long neck. The black ends of the wings have iridescent green wing patches (speculum).The eyes are orange and the beak is pinkish, with a black tip, black nostrils and black edges. The legs and feet are pinkish, turning redder when in breeding condition. 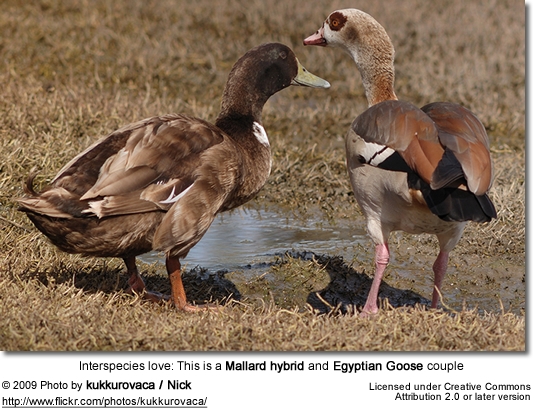 Males and females look alike; except the female is smaller and often has darker markings on the bill. Their calls are distinctly different. The male emits strong but hoarse hissing sounds, while the female makes harsh, trumpeting quacks. Juveniles have a duller plumage, with a darker crown and neck, and a grey tinge on the forewings. 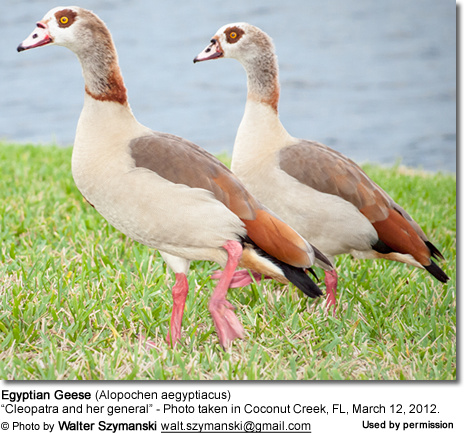 Their legs and beaks are yellowish. They lack the distinctive dark eye and chest patches of the adults. 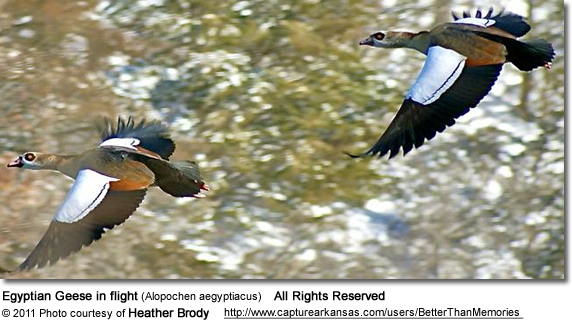 Egyptian Geese are monogamous (pair for life). Most breeding occurs in the spring, or at the end of the dry season. 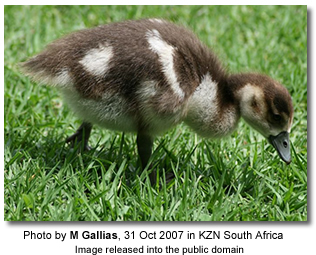 In some areas (such as South Africa), they may breed at any time of the year. They will accept a variety of nesting places. The nests may be simply placed among vegetation on the ground, in a building, on a cliff ledge or an embankment. They may also take over an abandoned bird's nest. However, in most cases, their nests are found in the cavities of mature trees. The nest is constructed out of plant material, such as reeds, leaves and grass. A clutch may consist of 5 - 12 white or creamy eggs that are incubated for about 28 - 30 days to hatching. The chicks fledge when they are about 60 to 75 days old and reach reproductive maturity when they are about two years old. Breeding pairs are fiercely territorial towards intruders and often pursue them into the air, engaging them in aerial "dogfights". They make a variety of vocalizations, including distinct differences between males and females. Males are generally quiet, but emit hoarse, subdued duck-like quacks when alarmed or excited. When trying to attract females, they will perform elaborate, noisy courtship displays, which involve honking, neck stretching and feather displays. Females tend to be noisier and their raucous quack can be heard frequently in aggression and almost incessantly when protecting her young. 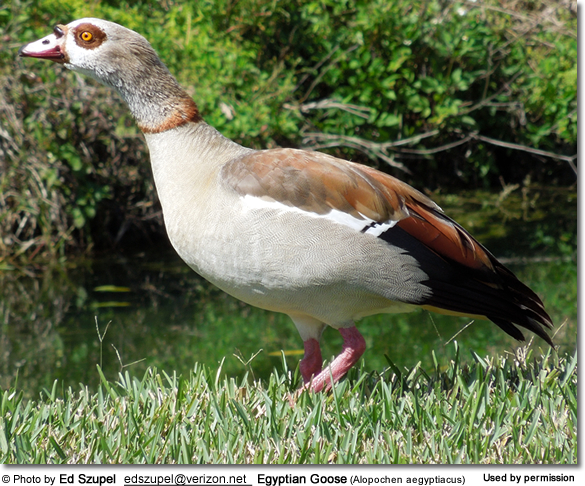 Egyptian geese eat various plant matter, including seeds, leaves, shoots, grain, grasses, plant stems and crops. They may also eat locusts, worms, winged termites and other small animals.